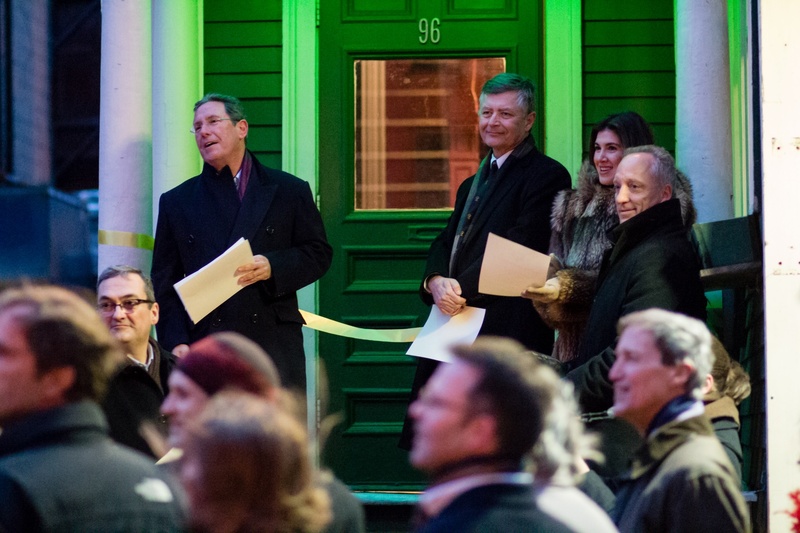 Flanked by Andrew L. Farkas '82 and Dean of the Faculty of Arts and Sciences Michael D. Smith, Cambridge Mayor David P. Maher presides over a ribbon cutting for the clubhouse of the Hasty Pudding Institute of 1770. 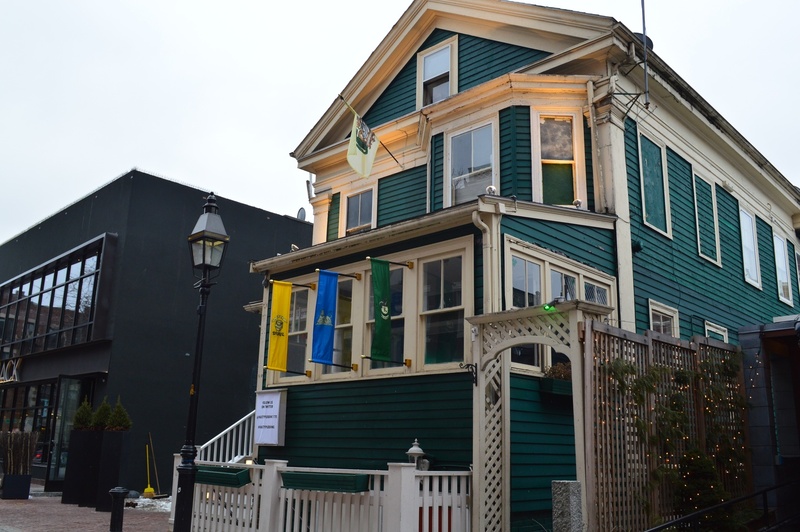 The Hasty Pudding Institute of 1770—comprised of The Hasty Pudding Club, Hasty Pudding Theatricals, and Harvard Krokodiloes—celebrated the unveiling of its new headquarters at the historic Hyde-Taylor House at 96 Winthrop St. with a dedication ceremony Saturday evening. “This is the culmination of four years of work to reconstitute the Hasty Puddings Institute of 1770, and it is gratifying in the extreme to see it come together,” Hasty Pudding chairman and “Grand Sphinx” Andrew L. Farkas ’82 told a crowd gathered for the ribbon-cutting that included undergraduates and alumni, as well as Cambridge Mayor David P. Maher. Dean of Student Life Stephen Lassonde, Dean of the Humanities Division Diana Sorensen, Dean of Freshmen Thomas A. Dingman ’67, and Dean of the Faculty of Arts and Sciences Michael D. Smith were all also in attendance at the club’s opening. The Hasty Pudding Club, which calls itself the oldest collegiate social club in the country, gave rise to the Theatricals in 1844 and the Kroks a capella group in 1946. The three distinct organizations merged into a single entity, known as The Hasty Pudding Institute of 1770, in September 2012. The building will be the sixth home to the Pudding in the institution’s more than two centuries of existence. 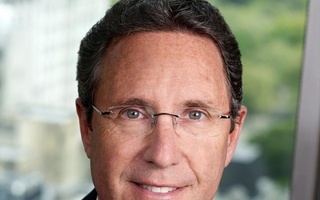 Most recently, the organization occupied a building at 2 Garden St. Farkas said in an interview in December that the Institute had been searching for a new space for some time in anticipation of the 2013 expiration of its Garden Street lease. 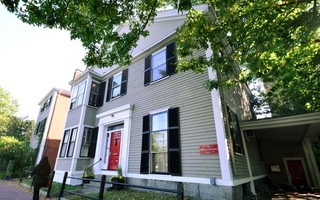 The Hasty Pudding Institute of 1770 has moved into its new home at 96 Winthrop St., the site previously occupied by Tommy Doyle's. The space formerly housed the Irish pub Tommy Doyle’s, which closed its doors on Dec. 22, as well as the original House of Blues, which shut down in 2003. The Institute launched renovations following its takeover of the building in late December. According to Fitzpatrick, the institute replaced the ice bins and coolers behind a large bar on the first floor of the building with additional shelving, seating, lamps, and books. “Can you think of anything more humorously Harvard than turning a bar into a study space?” he asked. In an effort to ensure that the Pudding would be represented in every aspect of the building, the Institute repainted the interior in Pudding colors, added the Institute’s name to the front of the building, and displayed banners adorned with the Pudding’s logos and crest. 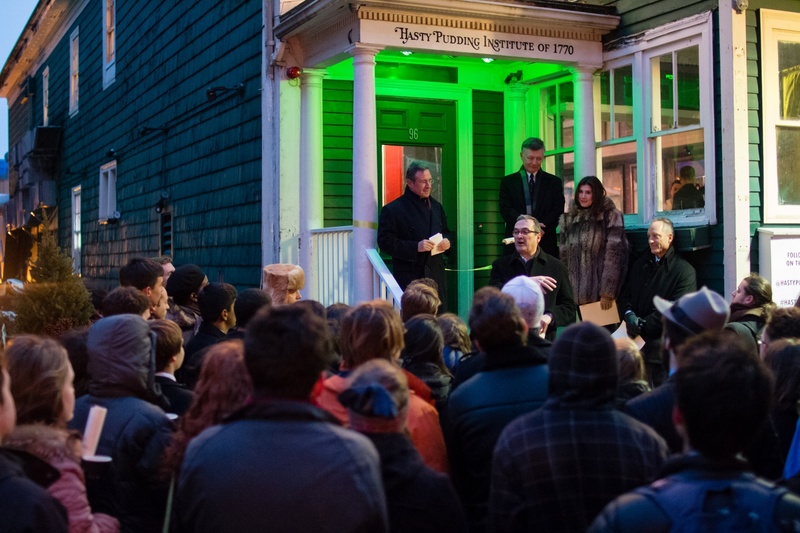 "Grand Sphinx" Andrew L. Farkas ’82, far left, speaks at the dedication of the new Hasty Pudding Institute of 1770 clubhouse to a crowd that included Dean of the Faculty of Arts and Science Michael D. Smith, far right. “It is going to be a space for study, a space for socializing, a space for camaraderie, rehearsal, performance, and fun,” Farkas said. In his own brief remarks at the opening, Smith noted his “admiration for everything Andrew [Farkas] does,” and encouraged students to enjoy the facility. Undergraduate leaders of the institute expressed excitement and enthusiasm for the new clubhouse. The remainder of the evening featured musical performances by the Kroks and Theatricals, an original Hasty Pudding frozen custard designed by neighboring Shake Shack, and actual Hasty Pudding—cornmeal stirred into a thick batter in boiling milk or water. The Hasty Pudding Theatricals’ annual production will continue to be held at its ancestral home and theater, Farkas Hall, at 10-12 Holyoke St., formerly known as the New College Theater. The theater is also home to the Hasty Pudding Lobby, a permanent museum exhibiting memorabilia from all three groups. —Staff writer Steven R. Watros contributed to the reporting of this story. —Staff writer Maddie Sewani can be reached at maddie.sewani@thecrimson.com. Follow her on Twitter @maddiesewani. The New College Theater will be renamed Farkas Hall following a significant donation from Andrew L. Farkas ’82.